What Is Clean Claim Rate? Working in the healthcare IT space, chances are good that you’ve encountered the term “clean claim rate” (CCR) at some point. In case you are unfamiliar, however, CCR is a key revenue cycle metric that indicates the quality of claims-related data being collected and reported in the form of a claim as it begins its journey from provider to the claim scrubber to the clearinghouse and on to the payer. As defined by HFMA in its MAP keys program, CCR is calculated by dividing the number of claims that pass all edits, thus requiring no manual intervention, by the total number of claims accepted into the claims processing tool for billing. If interested, the HFMA website contains a wealth of information on revenue cycle metrics at www.hfma.org/MAP/mapkeys. Why is this important? Because CCR is an indication to providers of the quality of data being collected upstream, as well as the amount of labor going into error resolution. While errors do get resolved and claims are being billed eventually, improving CCR means driving down the cost and time required to generate payments. It means less labor, measured as cost-to-bill or cost-to-collect, and lower accounts receivable (AR) days, thus quicker payments. As CCR improves, the cost savings can add up to millions (or billions, on an industry-wide scale) of dollars per year. That being said, while a strong CCR is obviously desirable for providers, it is not necessarily easily attained. There are two main factors that drive down CCR, which must be addressed if cost is to be reduced. To increase the chances of a claim being paid upon initial billing, it is important to ensure information was gathered and accurately input early in the patient’s interaction with the provider. From patient access staff at registration to clinicians providing care, to other healthcare professionals involved in generating the claim; it is important that everyone has the training and knowledge to gather the right data about a patient, their insurance, procedures undertaken and the relationship between those components. CCR, in many ways, can act like a probe of an organization’s data gathering and input processes, illustrating how upstream processes are working (or not). Constant payer and regulatory rule changes. Payers change their billing rules regularly, and it can be a challenge to keep up. The billing module in SSI’s Claims Director product, for example, tracks more than 100,000 payer rules, which must be updated weekly, if not daily, to stay current. Staying on top of these changes is a full-time job for a number of people, SSI has a large team of seasoned professionals who specifically work with payers on changing requirements. If there are sub-optimal system rules upstream, or poor integration between provider financial and clinical systems, it is easy for CCR to creep down because payer rule changes are overlooked. A 100 percent CCR may not be realistic given that upstream errors and data quality issues are tough to overcome entirely, and payer requirements are always changing. However, some organizations have come extremely close by having the right people, processes and technology in place. Most providers operate with a CCR in the range of 70–85 percent, even with significant investment. A CCR reaching above 90 percent is the result of strong systems integration and a persistent effort to keep system rules optimized and effective personnel training in place. Get serious about systems integration. Having the right information systems in place is important for streamlining data entry and improving accuracy, but you also need the systems to be properly tied together. The stronger the integration between systems throughout the billing software chain, the better your chances of improving CCR. Harness feedback loops between rules agents and health information systems to minimize the chance that downstream requirement changes are impacted by upstream system deficiencies. For example, as payers change what specific attachments they want submitted with claims, new procedures and drugs become available, and staff members come and go; robust integration along every part of the revenue cycle can reduce inefficiencies. Use segmentation to assess which area of the hospital are generating the errors that show up as impacts to the CCR. Also, ensure that systems interface with one another seamlessly enough to allow identification of errors’ root causes, and put in place checks to avoid recurrence of those issues. For instance, if a car accident happens and the patient access representative inputs the time of the accident as occurring after the time of treatment, that error could be flagged during billing. With the right integration and programming, however, the HIS registration system can be configured to prevent similar errors in the future. Embrace good governance practices throughout the revenue cycle. Improving CCR is easiest when you rely on smart processes based on operational best practices. Consider tapping into concepts from Lean/Six Sigma methodologies to optimize processes and make necessary changes that reduce labor and increase the speed at which claims move through the entire system. Enforce data input requirements, especially in patient access, where 30 percent of the information on a claim is entered. Put in place ongoing processes around error root cause analysis and an associated resolution action, which could be either software changes, personnel policy training, or process changes to assure accuracy of information. Assemble a multidisciplinary team that includes patient access, clinical, coding, IT and billing professionals that meets regularly to discuss opportunities for improvements along the revenue cycle. When it makes sense, adjust your organization’s processes to benefit the revenue cycle. For example, consider implementing real-time financial clearance checks for patients at the beginning of the process, determining whether insurance coverage and other provided information is up to date before issuing a prebill. These are the sort of governance initiatives that will take you from addressing low-hanging fruit to systematically improving CCR long term. Choose the right healthcare software vendors and collaborate with them. When working to improve CCR, the importance of harnessing the right revenue cycle software to find errors, prioritize resolution and address root causes is hard to overstate. A platform like SSI Claims Director, for instance, takes into account the latest payer, regulatory and other changes and applies billing rules to claims automatically so that billing professionals need only reference arcane rule definitions if they wish to when an error is detected. SSI Analytics, alternatively, is helpful for slicing data to find out where errors are coming from, whether that means from a specific payer or a specific functional area of your business. A user seeking to optimize CCR can look at a dashboard, for example, find that claims are being rejected by a high-dollar-value payer and prioritize resolving errors on those claims first. Regardless of what software platforms you deploy, make a concerted effort to work with your vendors. 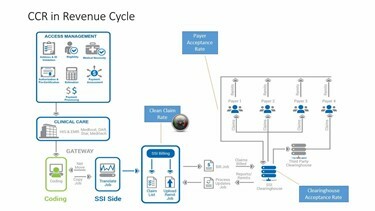 For instance, the SSI professional services team works directly with clients, laying out the intricacies and uniqueness of their complex revenue cycle in an intuitive way so that clients understand the flow of information well enough to make improvements. SSI also works closely with individual payers to understand the rule changes they are implementing so that the software effectively captures those requirements. 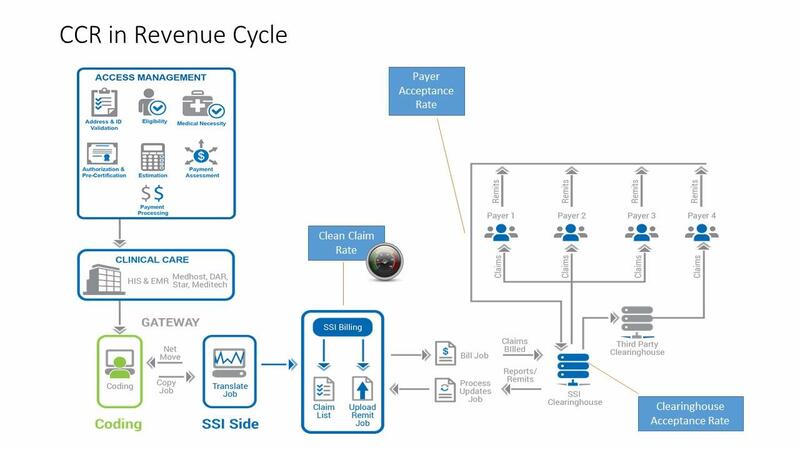 The SSI product engineering team works with upstream healthcare IT vendors like Epic and Cerner on an ongoing basis to keep revenue cycle software rule sets and functionality current and ready for whatever is coming next. As we enter a new year, consider this challenge: Think seriously about how you and your team can drive up CCR and significantly drive value for your organization in the process. Clean claim rate may not be the only measure of billing efficacy, but it is one of the best metrics of holistic billing-related data quality and the labor your organization is adding to the revenue cycle process in order to get claims billed. There will always be industry and system forces working against you and your CCR, but with the right people, processes and technology in place, significant error-related cost reductions are absolutely possible.